I have to create a Snake game for my school project in Python with PyGTK. I'm using Python 3.4 and I've installed PyGI 3.10.2 AIO rev18. 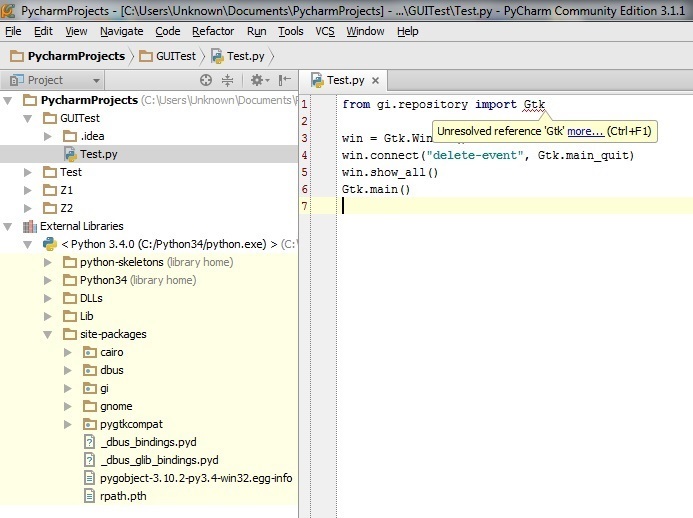 However, PyCharm can't seem to find GTK. It says "Unresolved refrence: 'Gtk' when I hover over Gtk in my import statement". Please help, if you have any assumptions about the problem. You should use Alt+Enter on the error, then go with "generate stubs". If you're lucky, it should solve the issue for you. It did not for me in current installations, but it has worked in the past.